February 2016 - Touch Display Research, Inc. 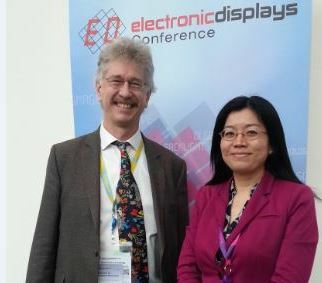 I just returned from the electronic Display Conference (eDC 2016), at Nuremberg, Germany. It’s a very successful conference with about 400 attendees. It’s my honor to meet some of you in person. On behalf of Touch Display Research, I gave a keynote presentation on touch panel, touchless sensor and emerging displays–market forecast and new opportunities. 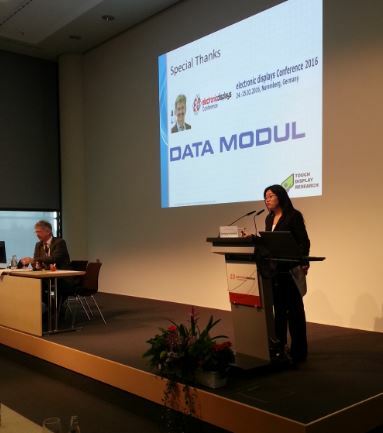 This keynote speech is sponsored by Data Modul. (which sponsored our 2014 keynote speech as well). Photo credit: Ms. Liu-Kost at Data Modul. This international conference also served to facilitate the exchange of latest progress and information between engineers, industry professionals, users, researchers, distributors, consultants and manufacturers acting in the area of advanced electronic displays and their applications. More analysis and review of the eDC 2016 can be found in the “Touch and Emerging Display” March 2016 monthly report. This entry was posted in Conference Review, Displays and tagged Data Modul, eDC 2016, Nuremberg Germany, Professor Blankenbach on February 29, 2016 by jennycolegrove. At ISE (Integrated Systems Europe) 2016, Cima Nanotech booth showcased large size touch display with Anoto’s active pen. The touch sensor is using ITO-replacement–Cima’s SANTE transparent conductor technology. The Anoto’s active pen is based on camera with micro dot technology. The active pen industry landscape has changed dramatically in recent 2 years: The number of companies actively working on active pen technology has increased from 60 companies in 2014 to over 100 companies in 2016. 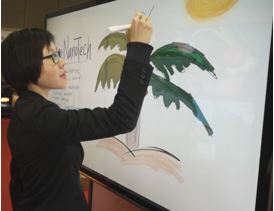 Touch Display Research defines active pen as a pen with an electronic circuit. Some active pens have an integrated battery in it, and others don’t. A passive pen has neither an electronic circuit nor a battery. In the recently published “Active Pen Technologies, Supply Chain and Market Forecast 2016 Report”, Second Edition, Touch Display Research Inc., analyzed more than twenty digital pen technologies, which include thirteen active pen technologies and eight passive pen technologies. Source: Touch Display Research, Active pen technologies supply chain and market forecast 2016 report. Digital pen input is very useful in education, certain language input, medical, finance, industry applications, and content creation. Active pen technology is superior to passive in terms of accuracy, pressure sensing, and input of fine line. We forecast that active pen usage will have rapid growth in the next several years. More analysis of active pen and active pen market forecast can be found in the “Active Pen Technologies, Supply Chain and Market Forecast 2016 Report”. More analysis of ITO-replacement transparent conductor for large size touch display can be found in the “ITO-replacement 2016 report”. Touch Display Research, Inc. (www.TouchDisplayResearch.com) is an independent technology market research and consulting firm specializing in touch screen and emerging display technologies such as OLED displays, OLED lighting, flexible displays, e-paper displays, ITO-replacement, Active pen, 3D displays, near-eye displays, pocket projectors, quantum dots, gesture controls, voice controls, and eye controls. Touch Display Research provides standard reports, consulting projects, and due diligence for touch suppliers, display manufacturers, consumer electronics ODMs/OEMs, material suppliers, investor companies, venture capitalists, and companies who are merging or acquiring companies in the touch screen, display, and materials industry. We are member of FlexTech Alliance and SID. This entry was posted in Active Pen, Displays, ITO replacement, large touch display, Touch screens and tagged active pen, active stylus, Anoto, Cima Nanotech, ISE 2016, ITO Replacement, large touch display on February 20, 2016 by jennycolegrove. At CES 2016, Touch Display Research had a chance to try on the bendable watch from E Ink and Polyera: Wove band. As we covered in October 2015 “Touch and Emerging Display” report, Polyera announced debut of its first flexible watch, which was also reported by Zegarki: the Wove Band. It uses a flexible electrophoretic display with a TFT backplane that can wrap around a wrist or be used flat. The display has 1040×200 pixel format. Polyera indicated the bendable watch is coming in 2016. Polyera was founded 10 years ago by CEO Phil Inagaki and Antonio Facchetti, co-founder and chief scientific officer. Currently, they have over 100 people. 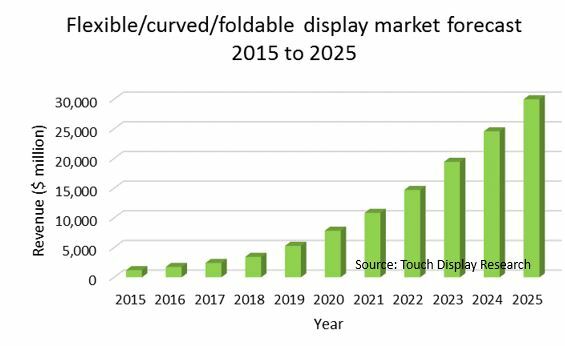 In the “Flexible, Curved, and Bendable Display Technologies and Market Forecast 2015 Report.” (Second Edition), Touch Display Research analyzed over 10 display technologies, over 14 applications of flexible displays, and shows how the flexible display market is accelerating. This report profiles over 270 companies working on flexible displays. This entry was posted in bi-stable display, Displays, Flexible curved display, Flexible touch screen, wearable and tagged bendable watch, e ink, flexible and curved, Flexible bendable curved display, flexible display, market forecast, Polyera on February 1, 2016 by jennycolegrove.